The Premiere Classe Agen Hotel is an ideal place to stay for families who want to take advantage of the nearby Walibi amusement park, which is just five kilometres from the hotel. The amusement park offers a brilliant family day out packed with thrills and excitement and is a sure way to keep everyone entertainment, regardless of age. Guests who would like to get some exercise and keep fit while they stay with the Premiere Classe Agen Hotel will find a swimming pool just four kilometres away. There is also a nightclub just two kilometres from the hotel for holiday makers who fancy spending one of their evenings dancing the night away. You will also have all of your shopping needs provided for while you stay at this Premiere Classe hotel, as there is a shopping centre just 100 metres from the hotel. 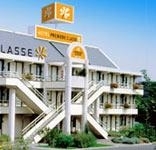 It is also worth remembering that the excellent transport connections from the Gare d'Agen d' Agen mean that guests staying with this Premiere Classe hotel will also be able to take advantage of everything Bordeaux and Toulouse have to offer to visitors. To get a typical French experience, why not plan a day discovering vineyards in and around the Bordeaux area, during which you will explore stunning chateaux and get to taste some outstanding wine.